Moving on is the hardest thing she’ll ever have to do. Taylor Scott sees the world differently than she did a year ago. She’s no longer the love-sick teenager, quick to smile and full of joy. Now she’s the broken college student just trying to get through the day without letting her feelings overwhelm her. It isn’t until she meets Josh that pieces of herself she’d lost start falling back into place and she can finally see that it’s okay to be happy again. Josh Walker is a professional athlete whose always avoided distractions. His career is just getting started and he works harder than anyone else. Hockey is his life. It’s the only thing that makes sense to him. When a new coach joins the team, it’s his daughter that threatens to complicate everything. He wants to help her. Needs to help her. But when he needs her to do the same, he finds out what she’s really made of. No one ever told him that the hardest part of his hockey career wouldn’t have to do with hockey at all. In 'Dreams' by Michelle Lynn, the past is a constant struggle while hope seems almost an irreparable goal. Yet, in true romantic fashion, love conquers all, and main characters Taylor and Josh find that through the sadness, heartache, and troubles that have seemingly conquered their lives, they can find new truth and maybe just have a chance to be happy again. Taylor Scott is not your typical nineteen-year-old girl. Having lost the love of her life at only eighteen, she knows grief and sorrow in a way that no one ever should. She has yet to pick up the pieces of what she considers her broken life, willing away the days despite knowing that Danny will never come back to her. She doesn't know how to move on, and even if she did, she has no desire to do so. She feels that if she did, she would be disgracing her relationship with Danny, and she can't bear to have that happen. Josh Walker is the light at the end of Taylor's grief-stricken tunnel. Even though she doesn't let him in at first, he kindly befriends her, not really expecting that much more will come from it. Not that he wouldn't want it to, but his good guy persona is not just a front. He's really that guy. In his friendships and his eventual relationship with Taylor, his sweetness shines through. His family life was never so great - especially his relationship with his brother Ethan - but he comes through it all with grace. Especially in the eyes of his brother's ex-girlfriend, Michaela, who is a voice of reason in Josh's life when things are not necessarily going so well for him. His hockey career is seemingly in danger, and if he has anything to say about it, no one ever needs to know what's wrong with him if that means it will affect his future. Yet both Taylor's and Josh's futures hinge on how they cope with their issues together. Their friendship eventually leads to sparks that turn into something more, but just when things seem to be going right, trouble strikes. They both have to figure out what they mean to each other and how to get past everything that has been weighing them down from their pasts in order to move forward with their future. 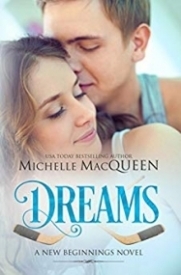 With a winning cast of side characters, including Taylor's roommate Abigail and Josh's teammate and roommate, Mack, along with Taylor's parents and many others, 'Dreams' is one of Michelle Lynn's 'New Beginnings' novels, and for anyone who has read all of them, they may find this one the best of the bunch. While the others had much of the same heart, sweetness, and romance, Taylor's and Josh's story is one that stands out. The fact that it tackles real-life issues and the ways in which people cope is a definite plus. Check out all of Lynn's 'New Beginnings' books. You won't be sorry you did! 'Dreams' is one of Michelle Lynn's 'New Beginnings' novels, and for anyone who has read all of them, they may find this one the best of the bunch. While the others had much of the same heart, sweetness, and romance, Taylor's and Josh's story is one that stands out. The fact that it tackles real-life issues and the ways in which people cope is a definite plus. Check out all of Lynn's 'New Beginnings' books. You won't be sorry you did! Taylor lost herself when the boy she loved died, and years later she cannot seem to return to life, or enjoyment. When she meets Josh, a professional hockey player, he stirs feelings she thought withered and dead. Can Josh mend her shattered heart? Especially when they each hide something from the other? We meet a broken-hearted Taylor in chapter one. There is good depth to her backstory. Her journey throughout the story is gradual, authentic, and thought out in great detail. Josh is not a typical hockey player. Through his sport we experience the full complexities of his personality and hardships. The main protagonists compliment and challenge each other, the reader roots for them from the outset. The sweet-frustration of the characters not recognizing this themselves builds through the piece, yet the Author does not let the frustration reach dire levels. This Author is known for her hockey-world romances; and the sport is integral to the characters and plot. Lovers of the sport will be impressed with the authenticity of this novel, and fans of Ms Michelle Lynn’s other hockey romances; Choices and Promises, can be assured of an action-packed novel written from a fresh aspect of the hockey world. The information we’re given is clear. The writing style is light and engaging. Professionally edited and suitable for 15 years +. Dreams is an easy-to-read young adult romance. "No one ever thinks they're going to lose the love of their life - at least, not at eighteen."